Limit how many times each “choice” on a multi-choice field may be selected. 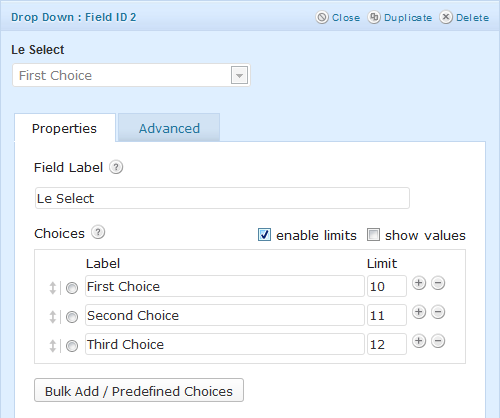 GP Limit Choices is a Gravity Forms plugin that allows you to limit how many times each “choice” on a multi-choice field may be selected (e.g. Radio Buttons, Checkboxes, Drop Downs, etc). It works with Product and Option fields with these input types as well. This perk enables you to specify a limit per choice on your multi-choice field. If a choice reaches its specified limit it will no longer appear in the field on the front-end. While the choice is visually removed from the frontend, it is still editable via the Form Editor so the limit may be adjusted. Navigate to an existing form or create a new form with a multi-choice field. Open the field’s settings and look for the checkbox labeled “enable limits” above the “Choices” section and next to the “enable values” option. Check the “enable limits” option to reveal a new “Limit” column for the “Choices” section. For each choice, specify a limit (as an integer) for how many times that choice should be able to be selected. Leave the limit blank for choices with no limit. If a limit is applied to choices in a Product or Option field and there is a Quantity field associated with that Product field, the quantity ordered will be counted towards the limit. This will give you the option to display how many spots are left in the choice label when using the Gravity Forms Limit Choices perk. Fixed issue where disabling choices (rather than removing) was not working as expected since version 1.6.26. Fixed potential performance issue when limiting choices on a form with a large amount of entries. Fixed issue where multiselect fields were not correctly limited. Added missing translaction support for rogue string. Fixed issue where choice counts for multi-input fields were not correctly retrieved in GF 2.3. Fixed issue limiting choices in multiselect fields with newer versions of Gravity Forms; field value now saved as JSON string. Updated minimum GF version to 1.9.15; resolves issue with dependency on gf_apply_filters() function. 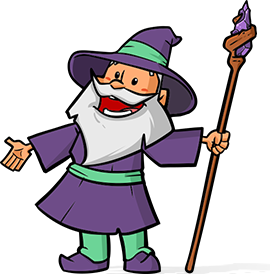 Added two new filters, "gplc_out_of_stock_message" and "gplc_not_enough_stock_message"
Fixed issue where exhausted choices were no longer correctly disabled when not removed due to change in Gravity Forms choice HTML IDs. Fixed issue where "gwlc_approved_payments_only" no longer functioned correctly since GF changed "Approved" status to "Paid"
Added support for disabling items rather than removing them, activated by 'gwlc_remove_choices' hook returning false. Fixed issue where if there were no more options on a required field and the user attempted to submit the form it would still successfully send. Added documentation and documentation images.